The open-air cafés of suburban Bougival, on the Seine outside Paris, were popular recreation spots for city dwellers, including the Impressionist painters. 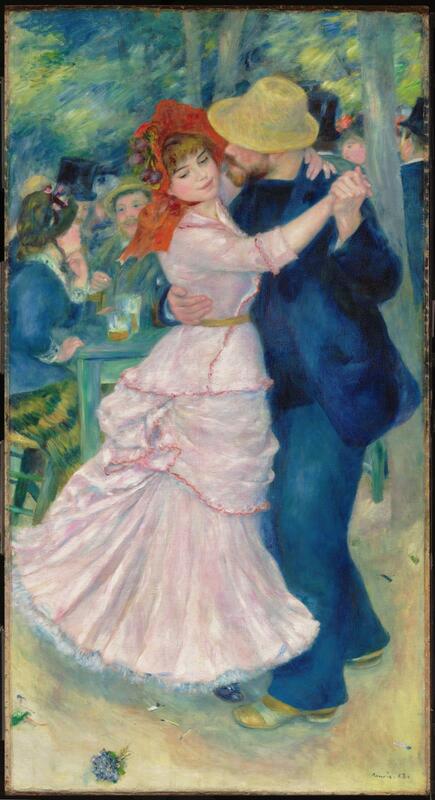 Renoir, who was primarily a figure painter, uses intense color and lush brushwork to heighten the sense of pleasure conveyed by the whirling couple who dominate the composition. 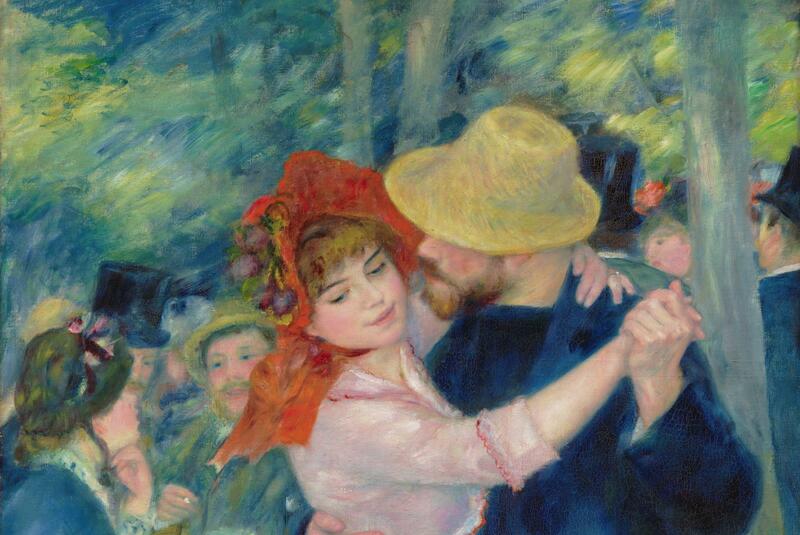 The woman’s face, framed by her red bonnet, is the focus of attention, both ours and her companion’s. 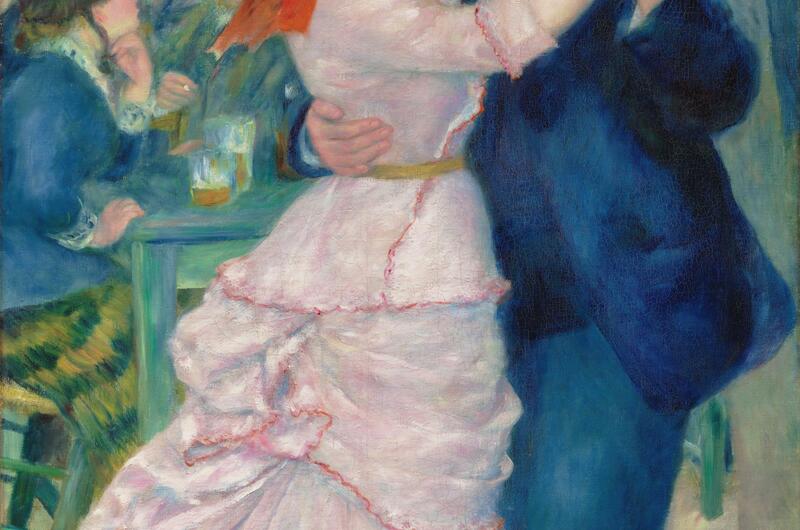 The early provenance and information about Durand-Ruel's transactions is taken from Colin B. Bailey, Renoir, Impressionism, and Full-Length Painting (exh. cat. Frick Collection, New York, 2012), p. 212. Maurice Barret-Décap owned the painting until at least February 9, 1937, as his correspondence with Seligmann attests. The provenance provided by Seligmann at the time of the painting's acquisition lists the name of Anthony Manley after that of Barret-Décap. The gallery's shipping papers from March 19, 1937, note that it was purchased from Manley on February 13 (year illegible; presumably 1937); Manley also wrote to Seligmann on April 3, 1937, regarding the payment of interest on the painting. It is possible that Barret-Décap sold the work to Seligmann through Manley, that the two men owned it jointly, or that Manley owned the work for a very short period of time, around February 9-13, 1937. De Hauke was a sales representative for Jacques Seligmann and Co. While he purchased works of art that were sold by the gallery, the ownership of the objects was often officially shared by several art dealers, and the transactions became quite complicated. De Hauke and Brame worked together on several occasions.